Learn together and make new friends! Highly qualified faculty of professional musicians on staff. Enrichment music classes, crafts, lunch hour concerts and an evening barbecue. Early-bird pricing: Save $50 per child! Registration forms and payment must be received no later than June 1. REFUND POLICY: Registration withdrawals prior to June 10 will receive a refund of 50% of the program fee. Withdrawals after June 10 are not eligible for a refund. Please note!!! Children ages 7 and under must be accompanied at all times by a parent or caregiver. For safety reasons, all participants are required to stay together in groups between classes, at breaks and over the lunch hour. Please see below for pricing and program details. For children age 3 and up with no prior lessons in violin or cello. Group classes offer a basic introduction to the instrument, and preliminary skills for playing. Highly recommended for those interested in enrolling their children in Suzuki string lessons in the fall. A limited number of cellos are available free of charge. Violinists and violists rent their own instruments. 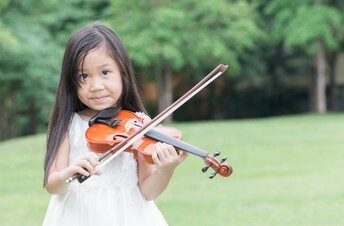 Having a properly sized instrument for your child is important! Call for details. For children who already play violin, viola or cello and are not yet fluent in reading music and not ready to play in an orchestra. Movement or rhythm classes and a craft / recreation period are included. For those who have played or are ready to play in an orchestra. Participants must have experience reading music. For more advanced players, Suzuki book 4 and up or equivalent. Classes use songs, nursery rhymes, dance, movement, instruments and fun to teach basic elements of music. Since talent can be created at a young age, children who attend music in early childhood classes have a head start when they are old enough to learn a musical instrument. The directors of the Summer String Experience wish to thank the Saskatchewan Orchestral Association, Sask Culture and Sask Lotteries for generous funding, which makes the Summer String Experience possible, and the University of Saskatchewan Department of Music for facilities. Julia McFarlane and Tricia Balmer will be joining us again this summer to lead classes in violin and cello, and conduct the orchestras. Both are accomplished teachers and musicians in the Greater Toronto Area. Applies to non-beginner programs only. Shortly after you submit your registration form, you will receive an invoice in your email inbox. The invoice will give you the option of paying via PayPal or credit card. Your registration will be considered complete once your form is submitted and payment is received.